The agency I work for is involved in this awesome recreation program called CHILL, sponsored by Burton, Sobe, Clif Bar and other companies. 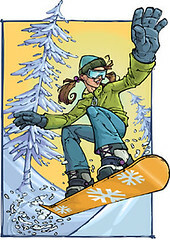 It provides, free of charge, use of equipment, lessons and lift passes to at risk youth to learn how to snowboard. I was invited to be a chaperone this year, which means falling on my bootie one night a week while I learn with my kids, and I am having a BLAST! Besides the kids getting to do something recreationally awesome, I am watching them grow as leaders, demonstrating kindness and patience, all things they struggle to learn in the classroom. So, give me 2 more weeks and I will totally be trickin’ out like the caricature above. And you better believe I have put up my skis permanently and started shopping around for the perfect board.